The United States of America is a collaboration of 50 states. One of the economic hub of the world, everyone dream of paying at least a onetime visit to this land of Americans. We have impressions made of this land through various sitcoms and movies from Hollywood. But, reality is far different from what is shown in the show businesses. Let us keep this discussion for some other day. Today, we have gathered some recent surveys and reports about the population of this country. In the article below you will find the top 10 most populated states of America. The Lone star state or Texas is known for its friendly citizens. It is the second most populated state in America. It is said that the economy of the whole USA will collapse if Texas is taken out of the equation. Such is the power of this state. 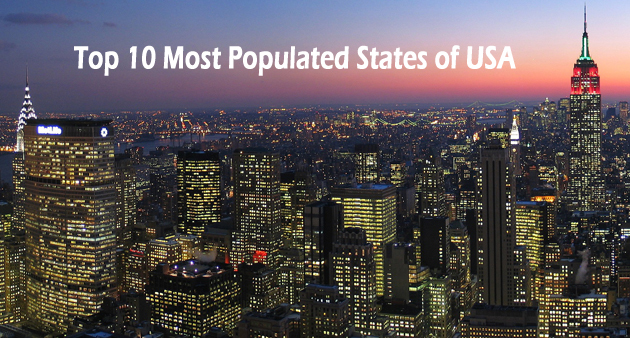 The most happening state of the world, New York also hosts a lot of population in the country. The Empire State is a complete package of museums and gallerias. Home to the Mighty Yankees, they never stop singing, “There isn’t another like it, no matter where you go…” The Lady Liberty welcomes all and makes everyone fall in love with the state. Georgia is another most populated state of America. Nicknamed as the Peach state, it is also known as the Empire of the South. The state enjoys an agriculture based economy with industries like Poultry and eggs, peanuts, cattle, hogs, dairy products etc. “Georgia, the whole day through; just an old sweet song keeps Georgia on my mind…” sings the Georgians. Their motto is Wisdom, justice, and moderation. This Wolverine state is located in the mid-western part of the country. It is surrounded by big five lakes, hence is the name Great Lake State attached to it. “The whisper of the forest tree; the thunder of the inland sea…” is what the state sings about. Michigan also hosts Detroit, the car capital of the world in its state. They go by the motto “If you seek a pleasant peninsula, look about you”.